Walking the dogs on the beach in the fog. An early start to try to catch the current going north through Sansum Narrows, we are not in a hurry to get home, but it is much more efficient if we can have the current helping through the passage, rather than try and fight it. We seem to be running ahead of the fog for the most part, heard several 'mayday's' from other sailboats (both had hit bottom on a falling tide!). Low tide in the morning, we love exploring what is revealed when the tide goes out. A long day, but we made good time through Juan de Fuca, hitting over 10 knots towards Victoria. Our rudder seems to be working okay, but there it is still a major concern. The morning started off very badly as we hit the bottom of the keel on a rock and then the rudder also hit a rock. We have done something to the rudder, but the extent of the damage will have to wait until we get home and have a look. I am sure we are going to be hauling out in the near future to do some repair. But the rest of the day, went not too badly. It was choppy but not windy to start, but as we moved away from Barkley Sound, the chop died off, and the swells evened out. Black bear near our anchorage at Refuge Island. We stayed two nights at Refuge Island because it was such a perfect anchorage. It was quiet, protected, scenic and great kayaking. Friday night we took the dingy up a small inlet to the end and discovered a beautiful river emptying into the inlet with waterfalls and pools. So, Saturday morning we took our towels and soap and headed up in our kayaks for a swim and a bath! It was wonderful! Today we have had some discussion about whether or not to head out of Barkley Sound today or stay one more night. The winds are favorable for a trip today, but it is getting late to get started. Tomorrow the forecast is for light winds, not the best scenario. We are still undecided... tune in later for more details! The verdict is in, we are staying one more night. We had a great afternoon sail across Imperial Eagle Channel, with winds up to 22 knots. We are settled in for the night now, the wind has mostly clamed down. We will get a very early start in the morning...... probably about 5:30 to head down Juan de Fuca to Port Renfrew or further if things are going our way. The hummers were so aggressive in this anchorage (flying right into our cockpit, trying to find something to eat around my head, etc), we finally decided to give them something to eat. The beer can has sugar water in it, I poked a hole in the side for them to feed from. I had to catch three of the little buggers to get them out of our cockpit, they kept flying in to find something to eat and then couldn't figure out how to get back out! The Frances Barkley taking a load of tourists to Ukee. Can you see the sailboat just coming out of the fog? The scenery here is absolutely gorgeous ! On one side we can see the high mountains of Vancouver Island and on the other side looking west we can see little islands in the bay and the setting sun behind. We had 15 knots of wind today, but right now it is very calm. We are going touring in dingy after dinner and maybe try a little fishing. We saw fish jumping in the bay before we put down the anchor. The fog starting to lift while we ate our breakfast. There was no internet reception at our anchorage, so we have hit the water early to hook up again to see what is happening in the world! Same old stuff, really! The fog is very thick, and we are using radar and our gps to guide us. We stopped to have breakfast close to Canoe Island, then continued on and found a nice anchorage in the Pinkerton Islands. This is a very quiet little anchorage, with beautiful green water. It is super clear, we can see down maybe 20 feet! Kayaked around the Pinkerton Islands, it is pretty here but not as much to see as yesterday. We are looking forward to the sunset tonight, hopefully if the fog does not come back. I played around with the colour on this picture on the trees, but the water is the same. Woke up today and the fog has rolled in again but the forecast is for clearing and some wind this afternoon. Rick and Rosita jammed out on our sailing trip today because of the weather, but will take us up on our offer to sail in the Gulf Islands. We are headed east in Barkley Sound to explore the eastern side which is actually part of Vancouver Island. This area is hugging the Vancouver Island Coastline, along the eastern shore of Barkley Sound, close to the entrance to Effingham Inlet. We have tucked in behind Robinson Island, out of the wind if any comes up. The ocean swell has been reduced to pretty much nothing here. A kayak tour around Robinson Island was a fun adventure, turning up some caves (it was low tide and a little too rough to enter) and TONS of starfish of all kinds. They are so beautiful while underwater, and very difficult to photograph with my camera. It is looking more and more like I am going to need a new camera that is waterproof. Just before dinner, we headed out in the kayaks again to take a tour of Julia Passage. This is an area that is float home central. Most of the homes are summer only, but a few have year round residents. Very interesting lifestyle. Check out the vegetable garden on the left side of the house. We are slowly making our way through Imperial Eagle Channel and then on to Bamfield. Tonight we are having dinner with Rick and Rosita at their house. Toured around Bamfielf Inlet in the dingy before heading to Rick's house "Seaview" to have a wonderful fresh (as in a few minutes ago) crab dinner and barbequed salmon. Yummm! Star fish coat the rocks at low tide. Barkley Sound... time to explore! Getting ready to head out for a kayak around Diana Island in the fog. We got to sleep in this morning to 7:00! It was very quiet and when we looked outside we couldn't see anything! We were in pea soup fog, but it is starting to life now, the sun is warming the boat up, Jerry is washing the breakfast dishes, and we will be heading out for a kayak shortly as low tide is at 9:45 this morning. Our anchor collected some 'stuff' overnight! This was the biggest glob of seaweed we have ever collected in one short night. We got an early start because we were rudely awoken by all the recreational fishermen zooming by in their boats! Oh well, it was just as well, because then we will just make it a super long day and get all the way to Barkley. It is almost lunch time right now and we are past Port Renfrew and almost even with Cape Flattery on the Olympic Penninsula. No wind yet and we have the current going with us. Today was a battle from after lunch until we put the anchor down. The winds picked up to 25 knots almost straight on, and the waves were 2 meters. We motor-sailed all afternoon, and are now exhausted and ready for bed! Jerry is already asleep. Tomorrow we get to sleep in, enjoy some down time and then get the kayaks out! Sun coming up this morning over the sailboats anchored near Sidney Spit. So far, no wind, but forecast is for 15 -20 knots this afternoon, coming straight at us. We are getting an early start to try and avoid the winds. Beautiful open bay, protected from the 15-20 knot westerly winds whipping through Juan de Fuca Straight. The water here is so clear, we could see our anchor chain laying on the bottom 16' down. The sun is out and it has turned into a beautiful day. Tomorrow we plan another early start to beat the wind again and have the currents going in the the same direction we to give us a boost. A little reminder of home! The 7:00 pm ferry leaving Sidney Harbour. Our first stop will be fuel and water in Chemainus. 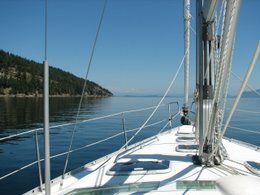 Through Sansum Narrows, around the south end of Saltspring Island to Portland Island. The winds were either right on our nose or non existant all day, so we have had to run the motor. Once we get the anchor down it will be nice to listen to the peace and quiet. Portland Island was given to Princess Margaret (1958) as a gift, but then in 1967 she gave it back to the province to make into a marine park. Another island that is very close by, Brackman Island is a nature reserve created by The NCC.